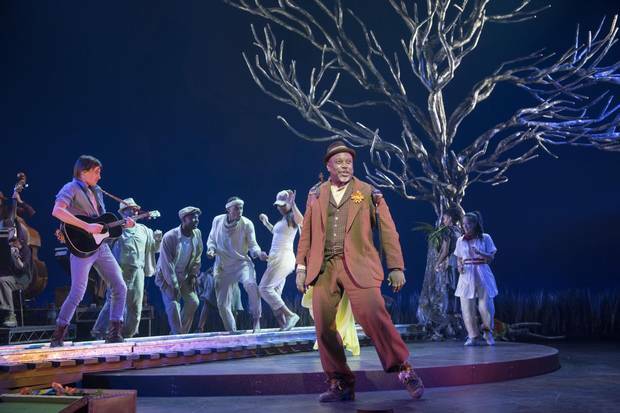 Hadestown, a folk opera based on the myth of Orpheus and Eurydice, opened in its latest incarnation at the Citadel Theatre in Edmonton last week. Rachel Chavkin is an American director whose career recently moved north from New York's hip downtown theatre scene to its commercial district around Times Square. The founding artistic director of the innovative off-Broadway collective The TEAM received a well-deserved Tony Award nomination for her immersive staging of the electro-pop musical Natasha, Pierre and the Great Comet of 1812 on Broadway in the spring. This fall, however, Chavkin's career moved even farther north than expected – to Edmonton. Hadestown, a folk opera based on the myth of Orpheus and Eurydice that the director has been developing with the American singer-songwriter Anaïs Mitchell, is her next project with eyes on the Great White Way – and opened in its latest incarnation at the Citadel Theatre on a snowy day last week. Just a couple of hours before its final preview performance, Chavkin looked surprisingly unflappable despite a day of rehearsal that saw writing changes integrated, a big chunk of a song cut and the ending radically changed. "I want this show to be very good here for Edmonton audiences and Canadian audiences, and at the same time, no one at the Citadel has implied that this is the finished, be-all/end-all version of this show," Chavkin said, somehow sprawled casually across three fold-up seats in the Citadel's Shoctor Theatre, her boots dangling over an armrest. "We've really got to hunker down and interrogate every aspect of the production – because we feel safe and supported by the Citadel to do so." 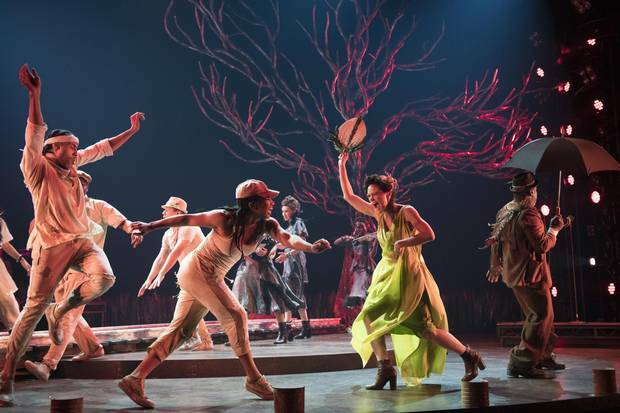 Hadestown has already had a well-received run in an immersive staging in the East Village at off-Broadway's New York Theatre Workshop – but if expanding a musical to fill a Broadway house is always a challenge, that especially is the case with one initially branded as "immersive." This theatrical buzzword is egregiously overused, but Chavkin defines it simply and elegantly as a show where "the audience is inside the picture." And she is as much of an expert in immersive theatre as anyone: The Great Comet, which was based on a section of War and Peace, was one of the first shows to really try to bring this style of staging to Broadway – with actors singing and dancing on platforms all around the Imperial Theatre on W 45th Street, spectators led through the backstage area to sit on the stage and dumplings and vodka available to help audiences really sink into the musical's Russian setting. Not the first, however: Chavkin is quick to point out the legendary Hal Prince's immersive production of Leonard Bernstein's Candide in 1974. There's no doubt, however that the appetite for them has grown in recent years, especially among younger audiences yearning for interaction. But how or whether it is even possible to size immersive up to a commercial scale in a satisfying way is a question many creators are grappling with these days. Chavkin is as much of an expert in immersive theatre as anyone: Natasha, Pierre and the Great Comet of 1812 , a production she staged, was one of the first shows to try to bring that style of staging to Broadway. Here Lies Love, David Byrne and Fatboy Slim's immersive musical about Imelda Marcos that turned a room at the Public Theatre into a dance club in 2013, had a new proscenium staging at the Seattle Repertory Theatre last spring – with an eye to making it to Broadway. Counting Sheep, meanwhile, a SummerWorks Festival hit by Toronto's Mark Marczyk and Marichka Marczyk and the Lemon Bucket Orkestra about the 2013-14 Ukrainian revolution, begins a run off-Broadway later this month – new director Kevin Newbury is charged with trying to figure out to make a show that took audiences inside the unrest in Kiev's Independence Square commercially feasible. How Chavkin and the rest of the creative team come to immerse themselves in Edmonton to experiment on Hadestown is its own story. The musical is the centrepiece of the first season programmed by the Citadel's upbeat new artistic director, Daryl Cloran. Cloran had seen both The Great Comet and Hadestown in New York – and was eager to have Chavkin come work in Edmonton with Canadian artists. "I remember seeing Great Comet and just feeling that Rachel was such an exciting director, both in the invention of her staging and also the heart that was in that piece," Cloran says. Hadestown is the centrepiece of the first season programmed by the Citadel’s upbeat new artistic director, Daryl Cloran. 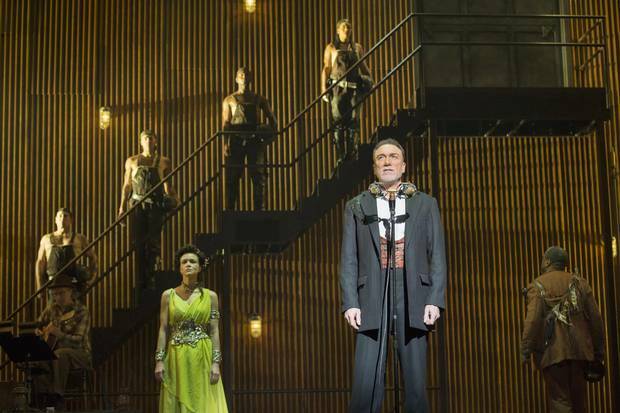 He cold-called Hadestown's commercial producers Octopus Theatricals, to see if they were interested in developing it further in Edmonton – and he says at first they were polite but clearly uninterested. He and outgoing executive director Penny Ritco were persistent, however – and eventually the producers came to realize not only what world-class facilities the Citadel offered, but also that a city with no direct flights to New York might be a positive. "I know part of the appeal of the Citadel was that they felt here was a level of anonymity, just off the beaten path, so it was less likely that the [New York] Times would come up," says Cloran, whose company budgeted the usual $600,000 it spends on a musical for Hadestown – although Octopus augmented the production with an unspecified amount of "enhancement money." The producers of Hadestown believe that having the show so far away from Broadway is actually a positive, as it helps to maintain a level of anonymity not available in New York. "Philosophically, this is very different approach to upsizing than I took with Comet," Chavkin says of Hadestown – and she doesn't mean just its detour to Alberta. With The Great Comet, she never altered what she calls "the design DNA" of the musical from first production to Broadway. With Hadestown, however, Chavkin and her designer, Rachel Hauck, are largely trying to make the show fit into a picture frame at the Citadel even if that meant, for instance, completely eliminating a huge part of the set during the tech run. "When [the audience is] outside the picture, I begin to make more visceral images for the audience to feel something in a way that might have been more subterranean in an immersive environment," Chavkin says, explaining her process while gesturing at the empty set. The Citadel audiences have certainly been responding well to the show as it is, but, just as her work there was wrapping up, Chavkin was already contemplating the next step on Hadestown's journey – wherever that may be, north, south, east or west. "One of the big things we've learned here is that we miss some of the club warmth that was created at the New York Theatre Workshop," she says. "I suspect our next set is going to be a hybrid of lessons from here and there."